I recently covered how to move all files from subdirectories into main directory using a Windows shell extension. If you prefer a clean shell you might be delighted to hear that there is another application out there that provides the same functionality. Copy all to one is that application. It comes with a clean interface that requires minimal user input; basically only the source folder and the destination are required before hitting the Start button of the software. 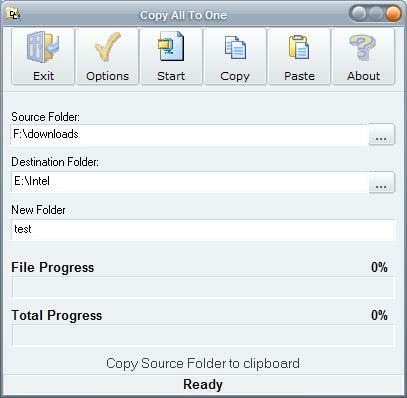 All subfolders of the selected source folder are processed automatically. A name for the destination folder can be selected as an option, it's New Folder by default. The program options provide several advanced features like copying only files that have a certain file extension, deleting the files in the source folder, renaming existing files and moving the files instead of copying them. The authors homepage is hard to navigate which is why I link to the file directly and to the homepage. It's a pretty solid application that comes in handy for users who clean up some folders regularly by moving files into other folders. Why is it saying I’m using Internet Explorer?